It gives you a greater range of motion than any other shoulder workouts, allowing you to focus on more muscle fibers and giving you a stronger contraction. 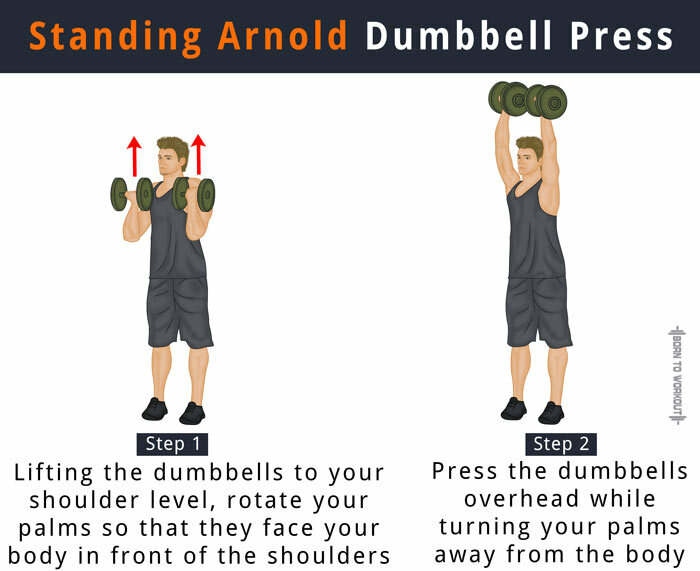 The Arnold dumbbell press stimulates your front deltoids better than any other dumbbell shoulder moves. Assume a seated position on a bench with your back placed against the support. Grab two dumbbells with your palms facing in and keep them in a resting position with the ends on your knees. Kick the knees up to push the dumbbells and take them to your chest level. Once the weights are in position, rotate your palms so that they are facing your body. This is the initial position. Raise the dumbbells up while rotating the palms until they face forward. 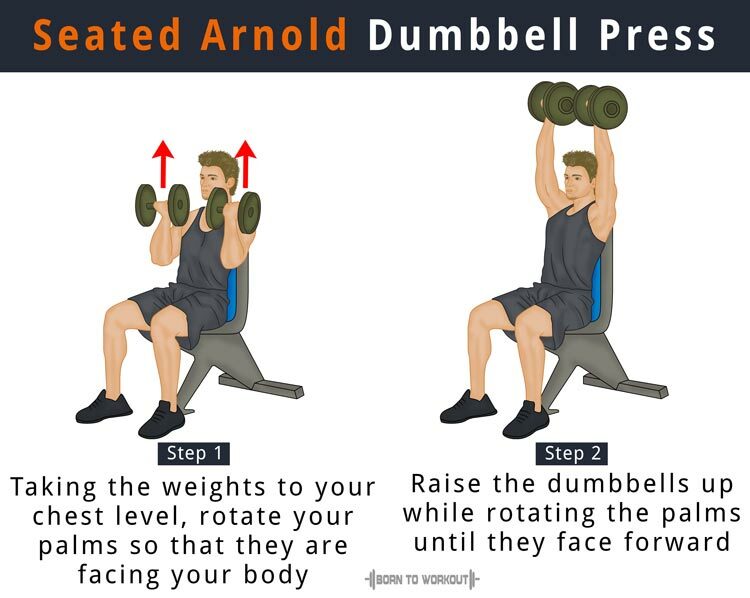 Continue pressing the dumbbells overhead until the arms are fully extended. After pausing at the top of the movement, gradually lower the weights to the starting position by rotating your palms towards you. Repeat the steps for the required number of reps. Grabbing two dumbbells in each hand, stand straight with your feet spaced at shoulder width. Lift the dumbbells to your shoulder level keeping the weights on each side. Rotate your palms so that they face your body in front of the shoulders. It is your initial position. Slowly press the dumbbells overhead while turning your palms away from the body. Continue lifting the dumbbells until your arms are fully extended. After pausing for a moment at the top, gradually lower the weights back to the starting position. Make sure that your back is kept straight through the entire exercise. Control the weights throughout the entire movement and allow complete rotation with the dumbbells. While lowering the weights, rotate the left arm in an anti-clockwise manner and the right one in a clockwise fashion.